Did you miss this Ping Pong Season? 2018/2019 PP Registration is Open!!! I’m pleased to announce that registration is open for the Winter 2018/2019 Ping Pong League. We look forward to another successful season. This years league will run from 10/5/18 - 1/18/19. 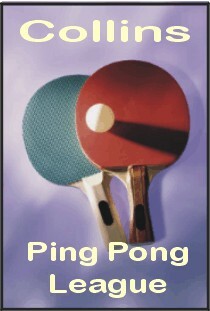 Ping Pong registration to open soon!!!! We will be opening up registration very soon for the Ping Pong Winter Session (2018/2019). Please stay tuned for a formal announcement in the coming days. Registration will open the first part of September. The tentative plan is to have the league available to everybody from the first part of October through the middle part of January. We will have year ending tournaments based on skill level (beginner, intermediate, and advanced). Stay tuned and look forward to seeing everyone. Check out https://www.pingskills.com/ for tutorials for people of all skill levels. You can create a free account that gives you access to many instructional videos and other great content. This site was developed by Olympic Coach Alois Rosario and Olympian Jeff Plumb. - League nights and times: Fridays from 5:30pm - 7:30pm. We will start on Friday 10/5/18 and continue through 1/18/19. 1. Players interested may register at any time during the season and play. 2. This season we will have four tables setup for play with dedicated tables for beginners, intermediate, and advanced players. We are encouraging players of all skill levels to come out play the game. 3. This year will be open play through the season with a season ending tournament for the three levels (beginner, intermediate, and advanced). 4. You may challenge any person at any time on any of the other tables as your skills improve through the season. 6. Players are expected to have their own paddles. However the recreational center front desk will have the basic paddles if needed. Ping Pong balls will be provided by the league. Note: Rules are subject to change at the discretion of the league coordinator, and updates will be announced on the Rockwell Table Tennis Website. Please email the league coordinator if you have any questions. Thank you. The Collins Ping Pong League is solely responsible for the content of this web site. Such content does not necessarily reflect the views of Collins Aerospace. Copyright ©2019 Collins Ping Pong League • All rights reserved.